As I have mentioned several times on this blog now, last weekend my bestfriend go home from America. This year we actually missed each others birthday which was really sad. I am 5 days older that her so usually we do something on the day of each of our birthdays so it is like we each get two birthdays! Anyway, I saw her this weekend and we had such a lovely girlie sleepover with yummy food and chick flicks! We also exchanged some very belated presents, and it made me laugh how we had both had the same idea and got each other some nice makeup. I gave her the Too Faced Boudoir Eyes Palette as I have it already and I knew she would love the colours. And she gave me this super cute set of little Benefit Minis. The set comes with six little products in the beautiful Benefit packaging. 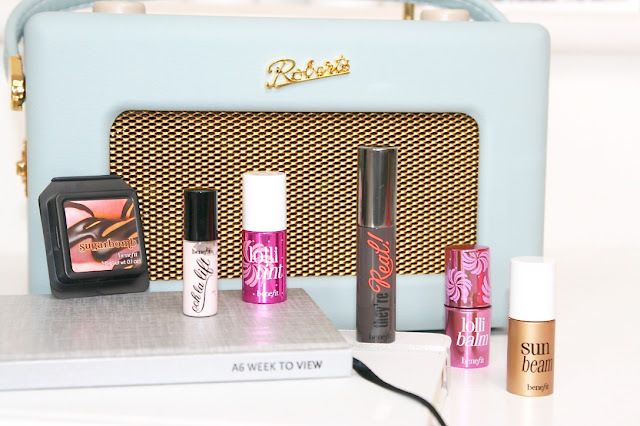 And I love minis as I think that they are a great way to try out products, especially more expensive ones without having to commit to buying the whole thing. Also mini products just look so cute! 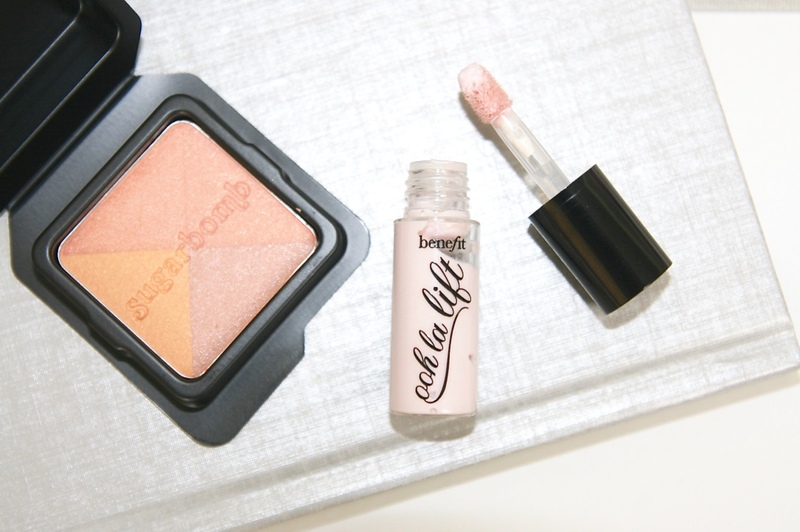 The first two, Sugarbomb and Ooh La Lift are both highlighter kind of products. Sugarbomb is a pretty pinky shimmer that you are meant to swirl the shades together and sweep over the face. I think I will be using this one as a blusher highlighter hybrid just on my cheeks for a bit of a glow. Ooh La Lift is meant to be used under the eyes and I have never tried a product like this so I am excited to see how that turns out. Although I hope it doesn't make my under eyes shimmery and draw even more attention to my bags! This mini makes me very excited as I have wanted to try this mascara for ages. 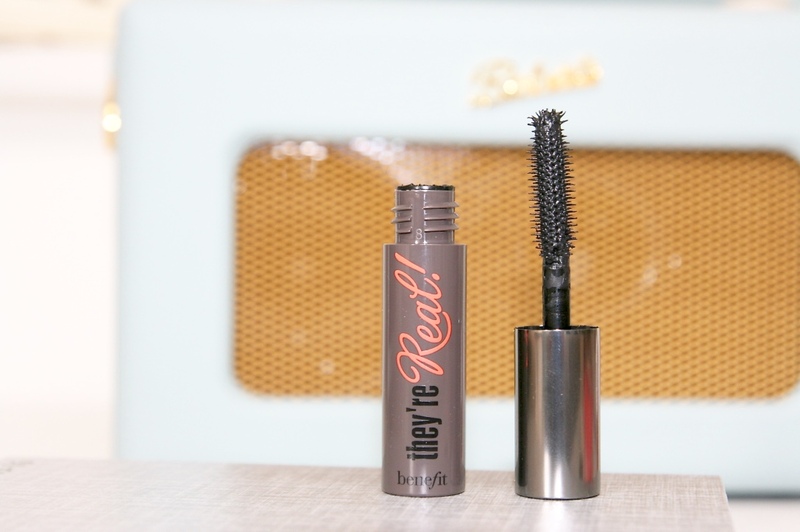 I am currently using the new Benefit mascara, Roller Lash which I absolutely love! I already tried this one yesterday and I already love it. I was rushing out with no other makeup on and did a few stokes of this on each eye. I wasn't at all clumpy and it just looked really pretty and natural which I loved. 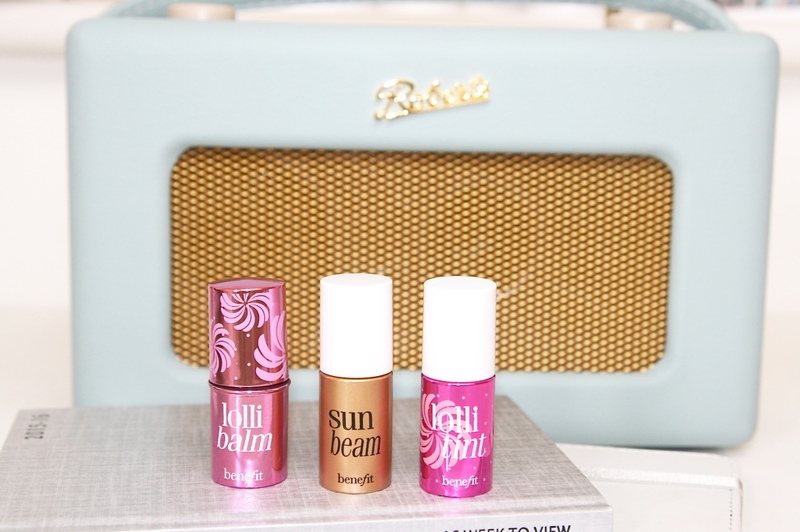 Sun beam is a highlighter that I already own and love so I might let my sister try out this little mini, I also have two Benefit tints, Posie Tint and Cha Cha Tint so I can't wait to see what Lolli tint is like in comparison. Lolli balm looks like a really beautiful lip balm, although I had a little look and it only twists up about 4mm so that probably isn't going to last me very long the rate I get through lip balm. I think I will have to save this one just for when I am wearing Lolli Tint! They all look so cute! I love Benefit products! I really want to try Benefit products, I might get the smaller sizes to try them out and see which I like. They look amazing!